After the gentle start it now gets altogether more taxing. The second is a demanding left to right dog-leg par four. 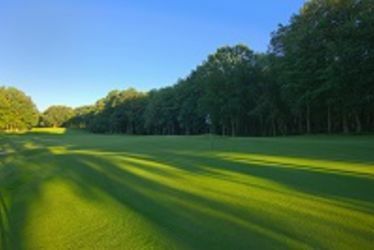 The generously wide fairway rises to a ridge at the dog leg but anything off the tee in the right half of the fairway will kick further right and will be blocked off by the trees, with little or no hope of reaching the green in regulation. Look for the holly tree over the top of the ridge on the left and aim between it and the centre. You have got to get fairly close to the ridge to have any chance of a clear shot to the green. Four bunkers protect the green making it a very difficult target to hit with a long second shot.